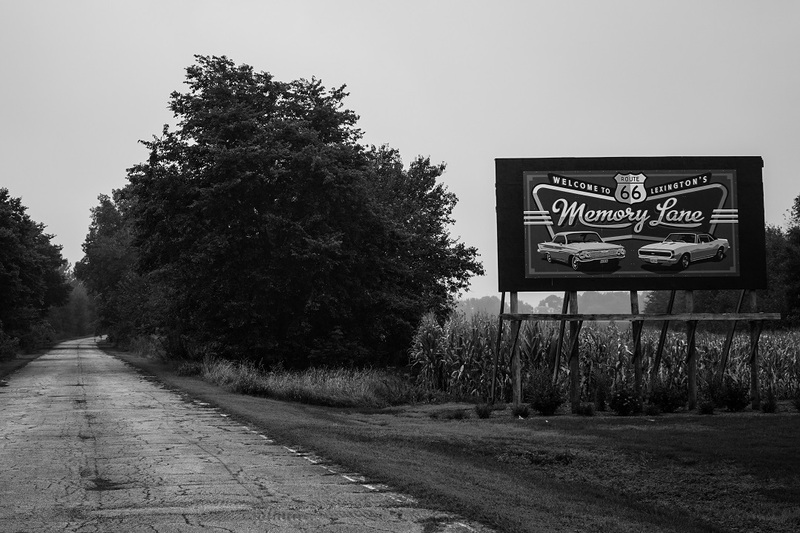 The first road trip I took that was focused specifically on Route 66 was July 5th, 2013. It was a Friday; I had the day off from work and decided to take the short drive from Tulsa to Miami, OK to see the Coleman Theater and take 66 back home. I had absolutely no idea that experience would be the first step in a larger journey. Nearly 800 days later, on August 23rd 2015, I was poised to complete that journey by connecting Chicago and Los Angeles, having driven Route 66 in its entirety. I awoke early on Sunday, eager to get started. I pulled back the curtains with a grin…and was greeted with overcast skies and drizzle. I had a moment of sadness, knowing that my photographic opportunities would be diminished, but it was quickly squashed with the gleeful knowledge that, rain or shine, my main goal was not impacted. It didn’t matter if I was being pelted by hailstones when I reached the Mississippi River; I would still be completing my journey along the Mother Road. We left the Best Western in Pontiac just before 9:00 AM and headed downtown. The downtown square in Pontiac is really something else. The courthouse was built in 1875 and looks like it was lifted straight out of Main Street USA at Disney World. The streets and alleyways are filled with delightful murals, including a pretty famous one on the back of the Hall of Fame building. It has a little drive-up section so you can take a photo of your car with the giant Route 66 Shield in the background. Next to it is the converted school bus that famous artist/cartographer Bob Waldmire lived in for many years. Most of the shops were closed, being early on a Sunday morning, and the streets were mostly empty. Church parking lots in the distance, however, were at capacity. Samantha happily carried an umbrella around, following my lead and providing shelter when I saw something I just had to capture with my camera. I know her excitement level wasn’t quite where mine was, but she was very happy to be with me on this momentous day. Once we were done wandering the square, we hopped in the car and headed down the road. The tiny town of Chenoa was similarly quiet, though there was an older woman in their downtown gazebo furiously weeding a garden. The town of Lexington has a lovely stretch of road on the east end of town called ‘Memory Lane’. It’s an original stretch of the historic highway now used as a walking path, lined with classic billboards and old signs. On some days, it’s opened to vehicular traffic. As luck would have it, the gate was open when we arrived. The foggy drizzle gave the road an eerie quality as the signs came into view, surrounded by thick foliage and backed by corn crops. I imagine walking the road is quite peaceful, though time did not allow for us to take such a pleasure. The next couple of towns were drive-through affairs. Normal didn’t hold anything that caught my eye and the David Davis Mansion in Bloomington was closed. Our next stop was Atlanta, IL. Samantha was helping me once more with the EZ Guide and had become very fond of the many GIANT ALERTS called out in the book. When she saw that Atlanta was home to another ‘Muffler Man’ statue she became quite animated. I smiled as we pulled into town and saw a couple of bikers taking photos of the hot-dog-wielding giant, oblivious to the dreary weather. We parked quickly and joined them in roadside revelry. Although we weren’t terribly hungry yet, the Palms Grill Cafe was open and had been advertising pie via billboards for the last dozen miles or so. We entered and sat at the counter, once again observing the locals as we enjoyed a meal. We planned poorly, as neither of us had room for pie when we were finished. Seriously, though, it looked amazing and we’ll have to come back. By the time we’d finished, several antique stores had opened across the street. Sam beelined for them as I continued to wander the street, admiring the octagonal Public Library and the turn-of-the-century grain silo. AS we were both finishing our exploration, the clouds started to separate! By the time we hopped into the car and arrived in Lincoln, the skies were a lovely mixture of blue and white. Lincoln is home to another beautiful courthouse and a ton of Abraham Lincoln paraphernalia, including a 24 foot tall covered wagon helmed by a 12 foot tall Lincoln statue! He’s reading a book that says LAW but I could see it was totally blank. No wonder we have so many interpretations today. We had to bypass the next town (Elkhart) due to construction closing the only road that crossed the railroad tracks; the detour was WAY out of the way. When we arrived in Springfield we discovered another detour was mandatory, as the Illinois State Fair was occurring! We circled the fairgrounds, wishing we had time to stop and see everything. When we made it to downtown, we were greeted with not one but TWO amazing domed buildings! Not courthouses this time, but the old and new State Capitol buildings. They are both right on the 1926-1930 alignment of the road, too. 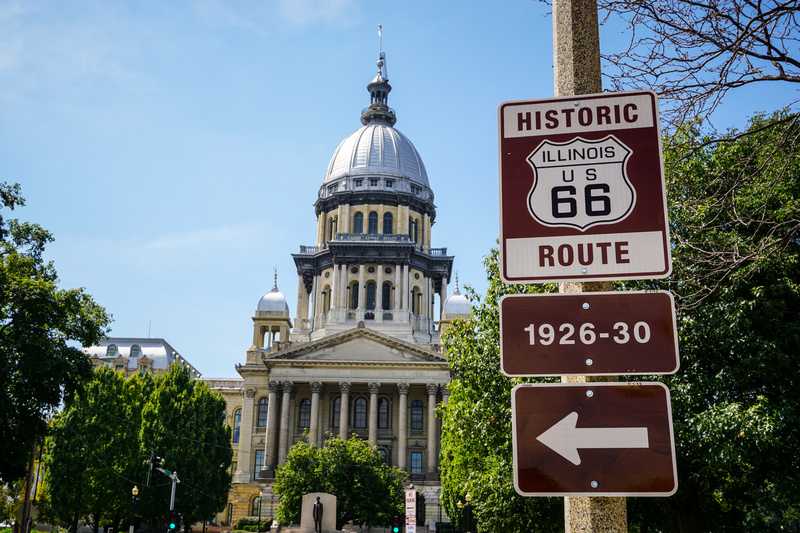 Illinois feels so much older than the rest of the route; somehow more regal. It felt downright colonial at times. 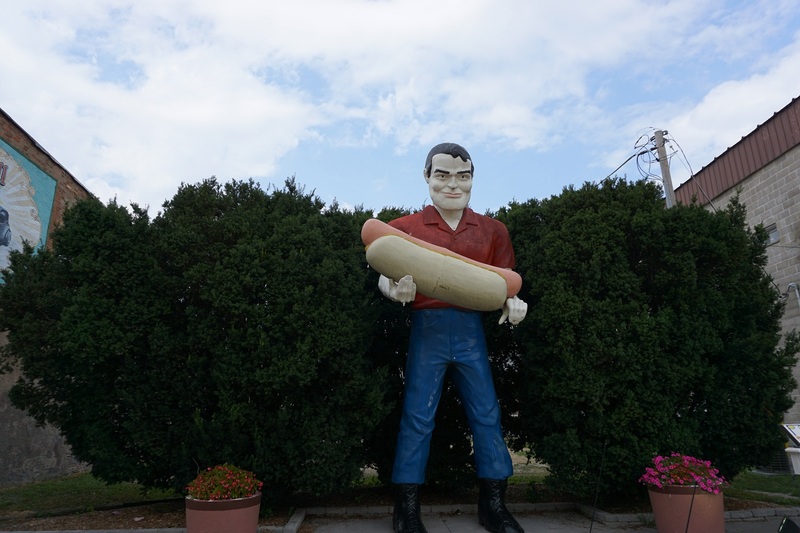 After we stopped and saw the last Muffler Man Giant in Illinois (the Lauterbach Giant, holding a big ol’ American Flag) we had to make a decision. In Springfield, the route has two major alignments west: the older alignment through Chatham, Girard, and Carterville or the newer alignment through Litchfield and Mt Olive. After looking at my map and examining my ‘Must See’ destinations, I opted for the earlier portion. 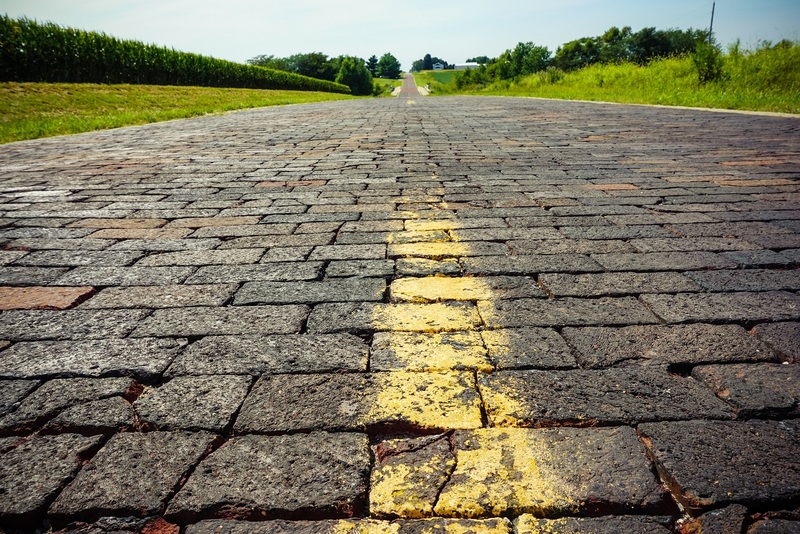 One of the major reasons for this was so we could drive the only remaining brick alignment in Illinois, just north of Auburn. Along this bit of road is Becky’s Barn, an antique store that I surprised Samantha by stopping at. I’d heard good things about the shop from my roadie friends and was eager to meet the owners. I was very sad to learn that Becky Hargett, namesake and co-owner of the shop, passed away in January. Her husband Rick has continued the business and was a delight to chat with. Ornery, smart, and not afraid to talk politics with any-and-all passers-by. Samantha found some goodies, too. And, hey, 10% for all Democrats and Union members! It instantly became one of our favorite places on all of Route 66. Continuing south and west, we stopped to see the Turkey Tracks near the town of Nilwood (a spot turkeys walked in the original 1920s concrete before it was dry) and another stunningly gorgeous courthouse in Carlinville. The shadows on the ground were beginning to stretch when we pulled up at Henry’s Rabbit Ranch in Staunton, which was sadly closed for the day. I was still able to get a few photos of the grounds, but I was disappointed I didn’t get to meet the folks (or bunnies!) at this iconic stop. A few miles later, past Edwardsville and into Mitchell, we finally arrived at the place that marked the completion of my 2,448 mile journey. The Chain of Rocks Bridge. 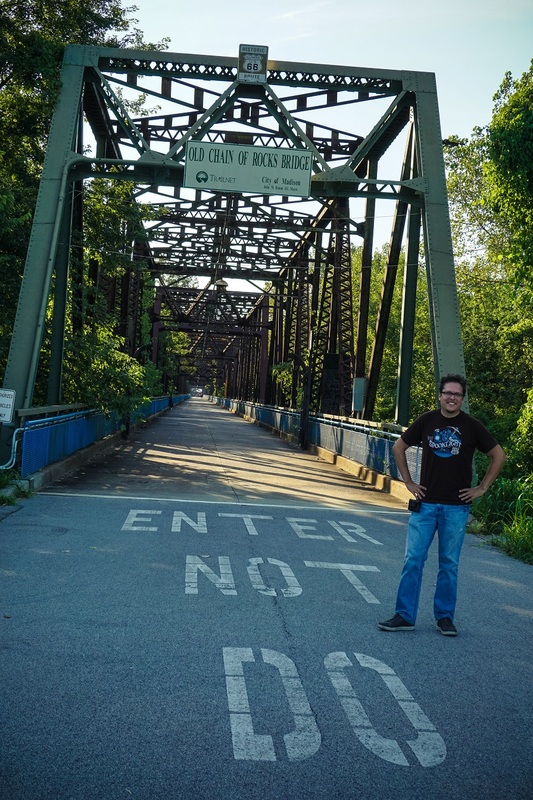 Until that day, the farthest east on Route 66 I’d been was the Chain of Rocks Bridge, a steel truss bridge that spans the Mississippi River. It’s now a pedestrian crossing; Samantha and I had walked across it from the Missouri side last March when we were in town to see an Arcade Fire concert. When we pulled up to the bridge, this time from the Illinois side, I could feel my heart beating in my chest. I walked over to the green metal frame and put my hands on my hips. I’d made it. Sure, there are a TON of alternate alignments I need to cover and countless communities that I need to explore in depth, but I could now say I’d traveled Route 66 end-to-end. I won’t lie; my eyes welled with tears and I got a little choked up after Sam took my picture. It is a moment I will never forget. Although my Route 66 journey was “complete” the drive itself wasn’t over. We still had to drive six hours home to Tulsa! We didn’t pull into the driveway until 12:30 AM. We were both exhausted, but the trip was entirely worth it. We were able to witness a beautiful wedding on the banks of Lake Michigan, contribute to the bustle of downtown Chicago, visit old friends and meet new ones, explore small towns and forgotten roads, and enjoy a delicious variety of fabulous food. The trip wasn’t without its bumps, but those paled in comparison to the positive experiences. It’s been an amazing journey…and it’s not anywhere near finished. I’m already thinking about my next trip on 66. 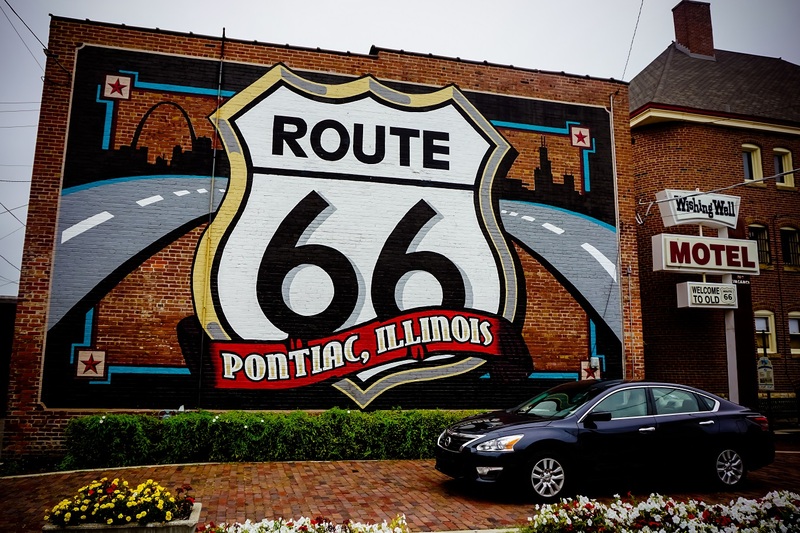 This entry was posted in Route 66, Travel and tagged auburn, Chain of Rocks, completion, Illinois, lincoln, Mother Road, muffler man, pontiac, road trip, route 66, Springfield, travel. Bookmark the permalink. Congrats on a dream come true! Very few people live their dream! You showed us perseverance is all we need to make it happen! Good luck on your future endeavors!